This is a modern app landing page template made by Designseer for you that helps you build your website in a matter of minutes which is responsive in tablet, mobile platforms as well. 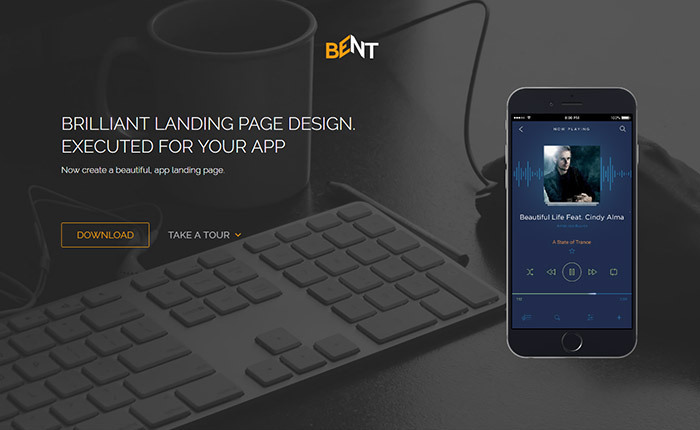 The CSS3 animations, parallax scrolling and sliders adds to the unique features of Bent. Built on top of Bootstrap framework this template makes it easy for you to create brilliant pages in minutes. Make your website shine on any device with elegant style. The template scales neatly on mobiles, tablets and desktops. Seo optimized sections with fully standard HTML5, CSS3 Bootstrap based markup ensure the website to rank well in google search results. The style.css and index.html is well commented for easy customization on the go. Documented the above in the index.html file. I am watching out your whole website design.It’s awesome. Specially that page design is attractive. What wordpress theme you are using for your website. I have trouble getting the contact form and the subscribe email sections to work. Added the contact form and fixed subscription form as well. Let me know if you have further questions. i need bottom element from this web, like loading when scrolling. Sry bad english. Can you show an example? This will help us understand your request better. I downloaded the updated version and added my mail to the contact.php file, but uploaded to the server does not send any emails. That’s all contact form should now work. Did you download the latest update? The download link is the same but its updated. Could you please provide us with the new one? Fixed. Dropbox stopped their public link feature and it is causing errors for our download links. archieve file can not be opened. Because it was damaged. Can you fixed this? thanks. best i ever seen, thanks! Thanks for this nice and useful template. One point : the contact form is still not working for me. I have added my email in the php form but I don’t receive anything. Do you know why? I think I’m not alone in this case..
Added a new contact form it was not included on the initial release. Let us know if you are still using it. Hi! I try to load theme to wordpress, it text that style.css and index.php files dont find, can you check please? Thanks for the awesome work! What an excellent template! Thanks! But the contat form is still not working. Please help! Hi! Contact form still doesn’t work. I downloaded the updated file, but that was not helping. Any help would be very appreciated, thank you! Me too Maga Agarskoi, I tried to load theme to wordpress, it text that style.css and index.php files dont find, can you check please? Its not a wordpress theme dear. i can’t have your contact form working after modify line 9 with the latest version.. Please try the latest version of the template. Download link is the same by the way. Anyone figured out how to get the form working? I’ve tried downloading the latest version and making the edits that “Prezes” mentioned, but still nothing. I got the contact form to work! Thank you really much Rafael, that works for me! Wow it works!! thanks Rafael! Cool contribution. We have updated the contact form as well. What kind of CC license does these templates fall under? HELP! The Contact Form doesn’t work.. Please help me. It’s really important. Hi Rijo, is it possible to make the navbar permanently visible and fixed at the top of the screen? Hey Rijo, I tried everything to make the contact form work. I´m still not successfull. Did you change something in the index-file? Hi Marco, Is the latest file still causing this issue?